The Icelandic nation is mesmerised in front of the screens at the moment as The National Icelandic Broadcasting Service (RÚV) has begun its first foray into so-called “Slow TV”, popularized by our cousins in Norway. The Norwegian state broadcaster has in the past had live feeds from f.ex. ferry sailing. 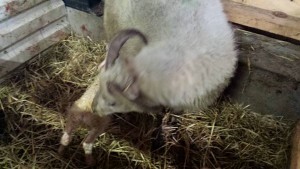 The first Icelandic slow tv broadcast is from the annual birthing of lambs. It is being shown live for 24 hours. Meanwhile the Icelandic film director Grímur Hákonarson is bringing his new film, Rams, to the Cannes Film Festival. It has been selected for the Un Certain Regard section. Rams is set in a remote Icelandic farming valley, where two brothers who haven’t spoken in 40 years have to come together in order to save what’s dearest to them – their sheep. The film was shot in the remote valley of Bárdardalur in the north of Iceland this past winter. Grímur has told Variety all about it. Here in the UK, the news do not focus on rams at the moment. Not exactly. However Nigel Farage and prince Charles have been on the news a lot today. The former leader of UKIP, Farage, doesn’t seem to know if he’s coming or going these days. You can read more about it here. Prince Charles 27 letters to then Prime Minister Tony Blair and members of his government between September 2004 and March 2005 have been in the spotlight. The question is if the letters influenced the government. The prince obviously cares about farming, cause writing to Mr Blair, he expresses a “growing sense of anxiety” that the Hill Farming Allowance, which supports farmers working on Britain’s uplands, could be scrapped. On the BBC news website you can read more about the letters.